Digital signatures are considered to be legally valid. And while they can be used as proof of signature and a court law, it does not mean that your client can't dispute the terms and conditions they have signed for... But that's another story. 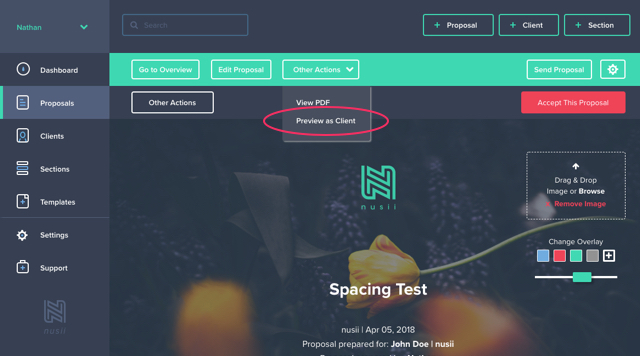 Open a proposal, and click 'Preview proposal' from here 'Other actions' then 'Preview as Client'. This will open a new tab where you will see exactly what your client does when they open their proposal. 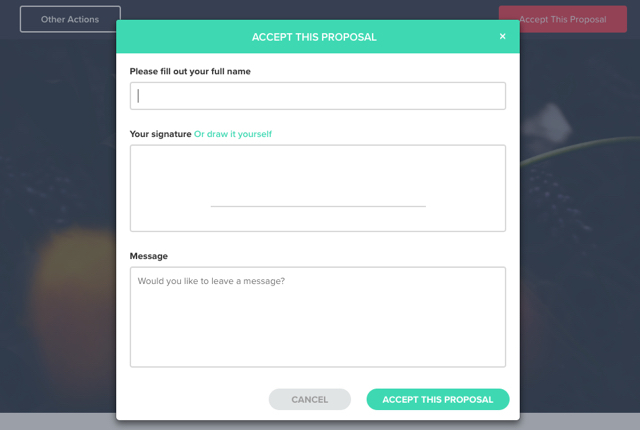 To digitally sign a proposal, your client will first select a pricing option (If used) or in the case of a fixed price proposal they can simply click the 'Accept this proposal' button in the taskbar. Once they click this button they will be presented with the signature modal. Here they can either type their name directly, or sign with a mouse or digital pen. Once accepted, you will have a saved time-stamp, their IP address, email address, name and of course their signature. You can view this at any point in the proposal overview.